After blowing a ninth-inning lead at Maestri Field on April 11 to South Alabama, the Privateers set out to jump-start their season on an 11-game road trip, but won just three of those games away from home. It was a challenging trip beginning with three-game swings at conference leader McNeese State, then a three-game non-conference tilt at Texas. New Orleans was unable to salvage any of those games, blowing a 6-0 lead at McNeese and dropping two one-run contests to the Longhorns along the way. 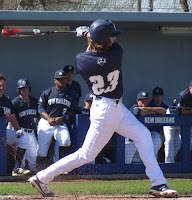 After poor weather forced a midweek tie at Jackson State in another game UNO led late, the Bucs secured wins on Friday and Saturday at Incarnate Word before their pitching broke down again on Sunday in a 10-9 slugfest loss after leading 8-3. Finally, New Orleans drubbed Grambling 10-1 on Tuesday night in a neutral site game in Biloxi. Orynn Veillon led UNO's offensive effort with five homers on the road trip. The Privateers (22-22-1, 10-11) sit in eighth place in the Southland and return home this Friday night for a critical series against third-place Houston Baptist.